It’s May, 2012. 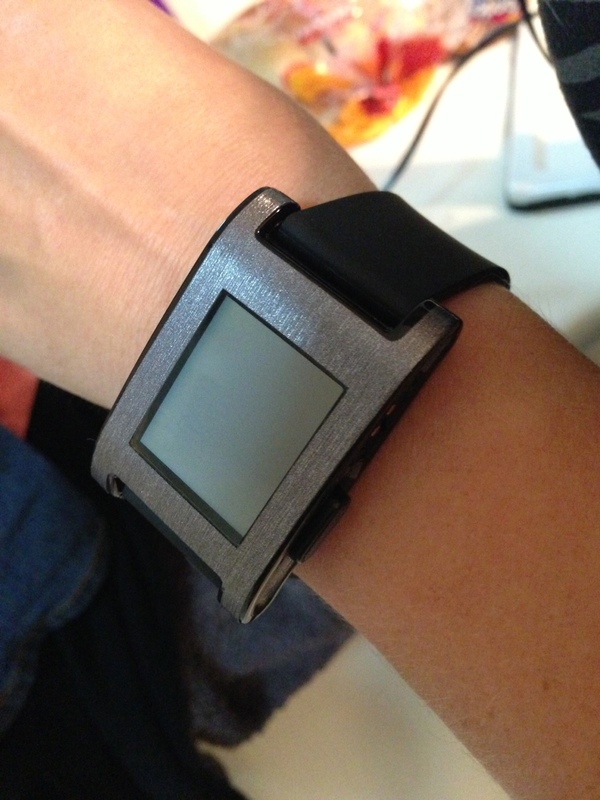 I Kickstart the already thoroughly kicked Pebble smartwatch project. Now, almost 12 months later, I receive my two watches (I can’t buy gadgets like this without also buying one for my wife). I have an iPhone 5, so all discussions relate to the iOS feature set. 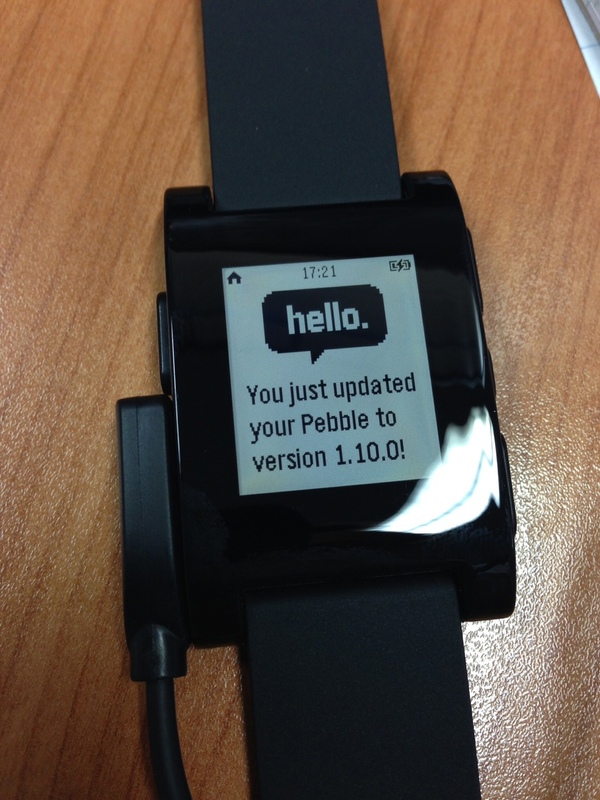 Note that I’m informed that there is much better notification support and integration on Android-Pebble pairings. That’s mostly to do with Android’s guts being splayed open like a cheap high school biology dissection subject. This time, it means the user wins. The box is great. ‘It’s Time’, the cardboard print tells me. Less gracious Kickstarter backers would be thinking ‘It’s About Time’, because the watch is about 6 months overdue for delivery. I understand the concept of Kickstarter a little better, though, and so I’m just glad I actually got something for my money. Kickstarter is not an indie shop, people! Inside the box is the watch and a rolled charger cord. Because the watch is waterproof, the charger is proprietary, with a magnetic plug on one side and a USB male plug on the other. All very pretty. I plug the charger in, and connect the magnetic plug, which is great but doesn’t hold on very solidly and can be knocked off easily. That’s not a really big deal though, but I recommend not trying to charge it while wearing it. My first thought was that the screen was too small, but when it was running it’s fine. I had to update the firmware immediately, put that’s pretty much a given these days. Pairing was super easy with my iPhone 5, and the app opened up and identified things such as ‘needs access to addressbook for caller id’ and ‘update available’. The update process was painless and smooth. The iPhone app is ok, but it looks a little cheap. Just a little. Something about the buttons/gradients isn’t quite right. Music controls beautifully, and the low-res screen nonetheless shows clear text, which is smoothed out even more by my slowly aging eyesight. The strap is very nice, and the watch itself looks gorgeous. It’s a little bulky on my thin wrists though. Little bit of a grease magnet but not too bad. My wife and I got some metallic skins (which I will detail a little later). 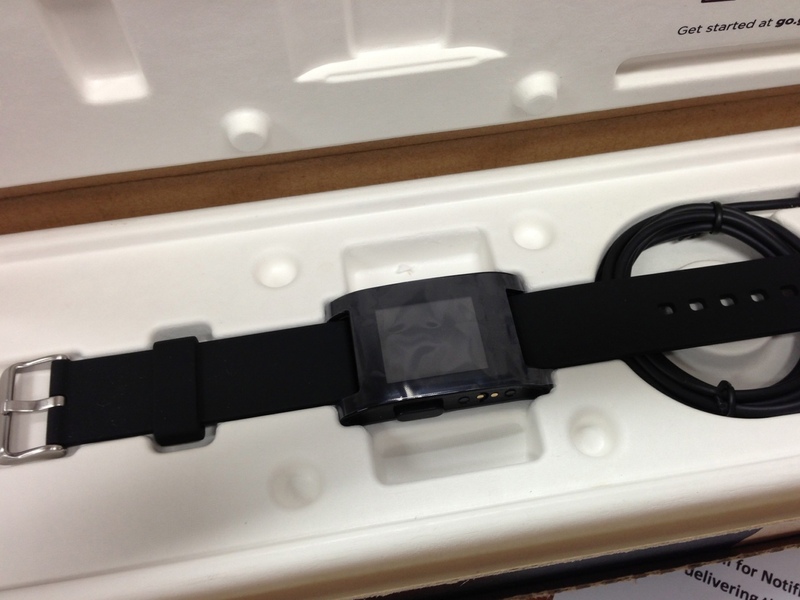 Looking at the watch in the flesh, though, I’m inclined to leave the black, as it’s quite stylish. The buzz is nice and not too annoying. Quiet. I disabled the always-on backlight and set it to ‘Auto’ and left the ‘Motion Backlight Enabled’ option On. Turns out there is an ambient light sensor as well as basic motion sensor on board. The backlight adjusts to on or off depending on surrounding light, and pops on nicely (but briefly) in the dark with a wrist flick or tap. The instructions tell you to check in the Notifications page of your settings app that ‘show in lock screen’ is enabled, but lots of online articles and discussions say that the only ‘guaranteed’ notifications are calls and SMSs. I enabled Find My Friends notifications, and my wrist dutifully buzzed when my wife left home to pick me up at work. This is AWESOME. I enabled ‘Do Not Disturb’, so that my phone would stop buzzing, and in the hope that my watch would continue to notify me. THIS WORKED TOO! This means I can disable my phone with Do Not Disturb, meaning the people I’m out with aren’t going to be annoyed by the constant buzzing of my phone. 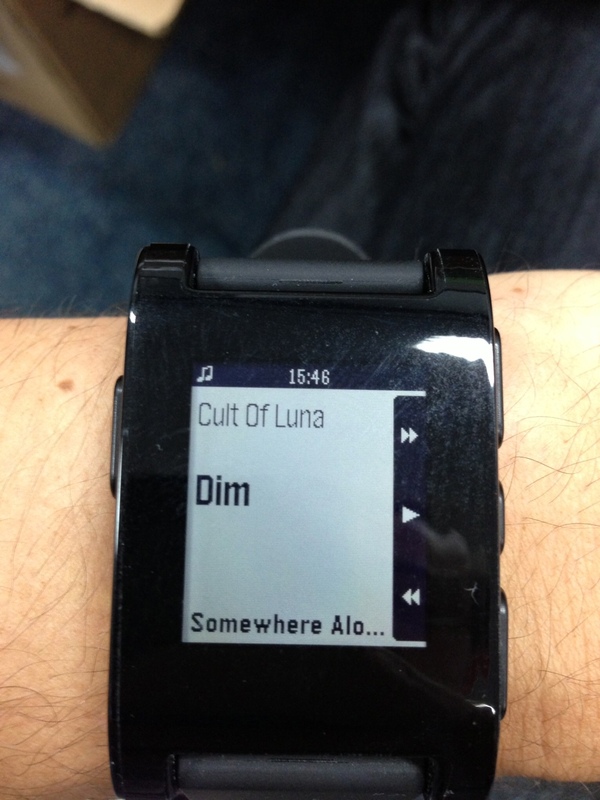 At the same time, I’m receiving quiet read-only cues directly to my wrist. I can get the information, but because replying now presents a higher barrier (requiring getting the phone and removing myself from the social chatter), I filter out the messages and am more engaged. Also, when someone calls me, I can ignore the call without pulling the phone out of my pocket. Ignoring phone calls is something like 90% of what I want to do with the phone part of my phone anyway! Answering calls is also possible, but you have to talk on the phone after you do. This might be cooler with a bluetooth headset. But I love this thing already. The UI is pretty intuitive. The device has ‘up/down/select’ buttons on one side (the ‘hand’ side if you wear your watch on your left wrist like I do) and a ‘back’ button on the left. This means you are navigating back with your thumb and interacting with your index and maybe middle finger. It works well, though the buttons click solidly and take some getting used to, as in these days of touch screen UIs we’re not used to handling our hardware quite so roughly. Not sure how people who wear their watchface wrist-inwards would fare, but tbh I’ve never understood those people, so I’ll choose to ignore them. Navigating in and around is clean, the text is crisp, and the menus are straightforward. Messages longer than the screen scroll neatly up and down. There’s no way to go back to your notification history – this is definitely a low-fi notification screen, not some kind of notification management platform. If you have the time to dig through your watch to go through notification history, you have the time to do it properly, on your phone. I’ve not had an urge to touch the screen or touch-interact with the UI in any way. I know other people have noticed the absence of touch, but it’s a non-issue for me (and I’m the kind of guy who occasionally reaches out to his MacBook Air screen to scroll it and gets confused). Maybe the mere context of being a watch fixes that for me. I never try to touch my Windows desktop screens either (no, Windows 8, you are the Star Wars prequels of operating systems to me, and you fall outside this discussion). There are some core features baked into this watch which are not yet activated by the OS or available through the SDK, notable a magnetometer (which would allow the watch to function as a compass without talking to your phone), and proper gestural awareness (as far as I understand it the accelerometer merely picks up the presence of motion at this stage, not other directional information). Steps for iOS (sorry, Android fans, I have no idea how it would work on your devices, but it’s probably something similar): navigate to those links on your paired device, select ‘open in Pebble’, marvel. These are, ostensibly, beta applications, so I won’t be held responsible for anyone installing them on the Pebble. In my experience they worked great. Note that they may be out of date, depending on when you are reading this. There were many more applications being developed and shared on the forums, so bearing in mind the risk of crashing your watch (ha!) it’s worth looking. The app in the picture here is a polyhedral dice roller app that a nerd like me can use in lieu of actual polyhedral dice. 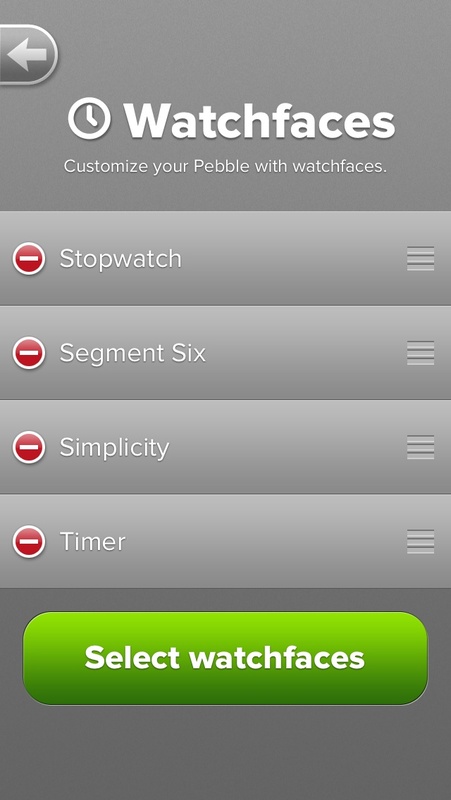 I’ve also heard that RunKeeper will have some software by the end of April. That’s very exciting, as I do a lot of running these days, and have pace/distance/time on my watch would be FREAKIN’ AMAZING. One final thing about software: I tested this on both the timer and stopwatch: if you back out of the app, it doesn’t remember its values. The stopwatch is reset, as is the timer. This is probably a sandboxing feature of the Pebble OS, but it is something you need to bear in mind. I did test that notifications do not interrupt the active app (you can see the notification and back out without exiting the app). We also purchased three Skinomi skins. These came in high-quality packaging, with lots of instructions and help. They were pretty fiddly to install, but the end result for my wife was a fine looking and textured carbon-fibre brushed metal, while mine was merely a clear protection layer. 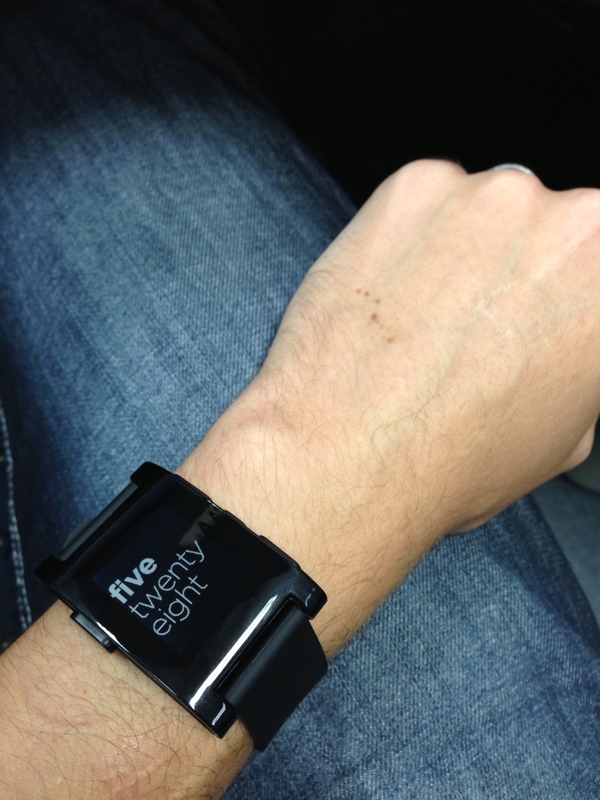 I’ve been told the Pebble watchface scratches relatively easily. I managed to discover a bug with the alarm clock. While creating a new alarm, which you do by setting first the hour, and then the minutes, if you back out of the minutes screen and return to the hours screen, the app freezes, and then the phone crashes and reboots. Whoops. I logged this bug, so try not to do it until they update the firmware. Unsupported notifications (basically anything that isn’t SMS or phone calls) are supposed to be interrupted if your Bluetooth connection breaks or is interrupted. I believe the fix is to go back into notification centre and toggle ‘Show in Lock Screen’ on and off for each affected application. The problem with this, other than the annoying time sink, is that you can’t really tell if you’ve reenabled notifications, and it’s hard to test whether they’re back on or not. 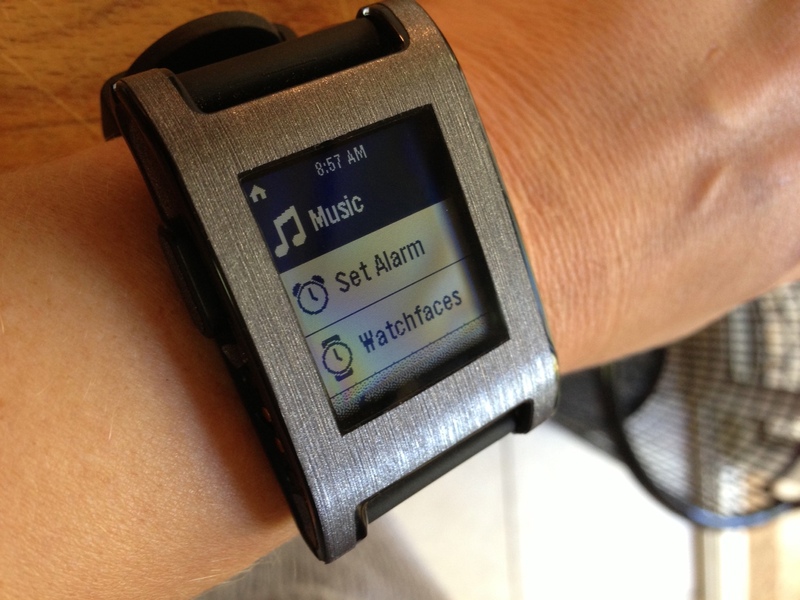 A list of ‘listening’ applications on the Pebble app would be great, but I’m not sure the iOS architecture allows that. This is probably the biggest pain of the watch – that its primary purpose is unreliable. I see myself becoming very quickly reliant on the easy-access notifications, and having them drop out unpredictably is going to start sucking, hard. This is the biggest ‘beta’ aspect of the Pebble watch, and although I realise a lot of it is to do with Apple’s secure OS, it still reflects on the Pebble company. Hopefully this will sort itself out soon. There’s an oily discoloration visible when the screen is ‘white’ and viewed at an angle. I’m not really bothered but have included a picture here. My wife’s does/does not have this same discoloration, so I would mark it down as a manufacturing fault. It isn’t noticeable from the front. I was annoyed that I couldn’t see the battery unless I was charging. There’s no ‘battery indicator’ on the device. However, my wife did some digging and discovered that the battery indicator is actually pretty smart, showing only when full or almost empty and REALLY almost empty. When the ‘almost empty’ indicator appears, you apparently have 12-20hrs notice to charge the watch. If you are talking to someone in the messaging app, new messages from them won’t trigger notifications, so you won’t get a buzz on your wrist. Makes sense. You’ll still get other messages that do trigger notifications, for example from someone you aren’t talking to. I haven’t tested all the various permutations, but it’s reliable. I used it out of the box for a day or so before deciding to charge it. No battery warnings or indicators had come up. I fully charged it overnight on a Friday. With regular use I finally got the low-battery warning on Thursday morning, making it a solid 6 days, which is perfectly acceptable in my opinion. 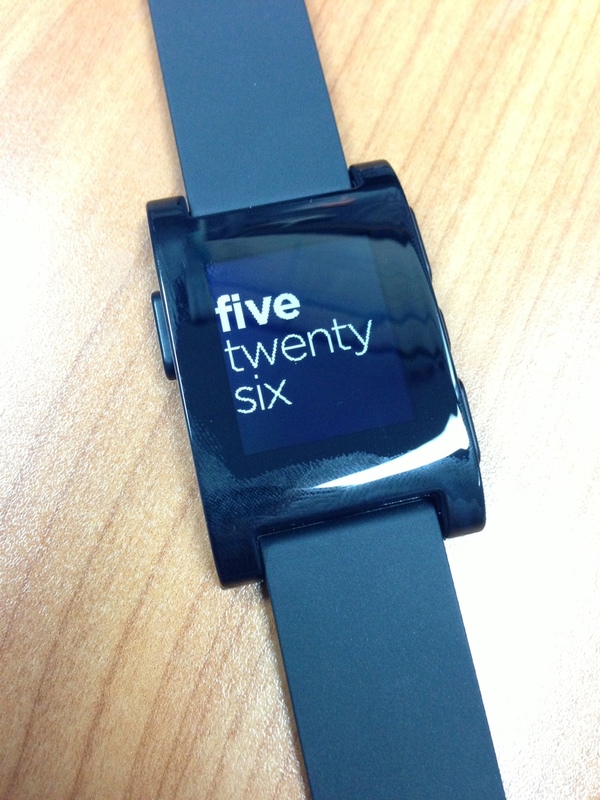 Unlike my phone, whose battery level I am constantly aware of, I’m treating the Pebble like an old school watch. When the first low-battery warning appeared, I got a solid 20 more hours before I charged it. The second battery warning came only three days later, which surprised me. I’d been receiving a lot of text messages though, and the vibration is a big drain on the battery. When the low-battery warning appeared this time, I kept using the watch for another day or so, ignoring the second ‘really-low’ battery warning, and eventually it just switched off. It takes a few hours to fully recharge, and I missed it on my wrist the whole time! I will keep an eye on it going forward, but so far I class battery life as ‘acceptable’. Feel double buzz and realise it’s probably a message instead of email or some other buzzing. Decide whether to check the phone. Usually decide yes. Take phone out of pocket. Press a button, if the screen is off. I went for a lunchtime jog, having shot off a few messages before I left. I run with the phone in a pocket, obviously, and the running app iSmoothrun Pro (great app, weird name) operating in the background. As I was running, confirmation messages were coming in and appearing on my watch. It was simply the best. Better, I could start and stop the music without fumbling with my phone. Afterwards I had a shower and didn’t take off the watch, just because I could. I even used the stopwatch app to see how long a shower I had. The Skinomi skin was unaffected afterwards. One problem I had was wandering away and leaving my phone behind, because I’m already getting used to the information I want appearing on my wrist. The problem with this is that I wander out of bluetooth range and end up disconnecting, going through that whole ‘fiddling with notifications’ thing. Annoying. Another problem is the iOS limitation (apparently) which disconnects bluetooth devices after several hours of inactivity. That means that overnight, all notifications that aren’t iMessage/SMS/Calls stop coming through to your watch unless you go through that toggle scenario again. Also quite annoying. My usage case here is that whenever I want to get notifications from a non-default notification source, I actively reenable each app in the notifications settings page. This is annoying, but works well to avoid accidentally missing a notification that has been ‘reset’. In practice then, my phone is used to manage messages and calls and music, and occasionally Find my Friends, for which a watch notification is perfect. Once the notification reset bug is addressed, I see my watch notification list expanding significantly. I already receive weather forecast notifications on my watch in the morning, and it’s really cool. For gadget nerds, this is the best smartwatch tech out there. How can I know this for sure, not having tested any other devices? I can’t know. But it’s pretty great and I rely on it a lot now, and I wrote a long review about the whole process. For consumers, I think the experience is just a little bit raw. I can’t speak for Android phone users, because I believe the experience is more robust for them, but for iPhone users the limitations are a little annoying. Longer battery life: this is already great but as the usage goes up and more apps start running on the watch I’ll need more. MORE! 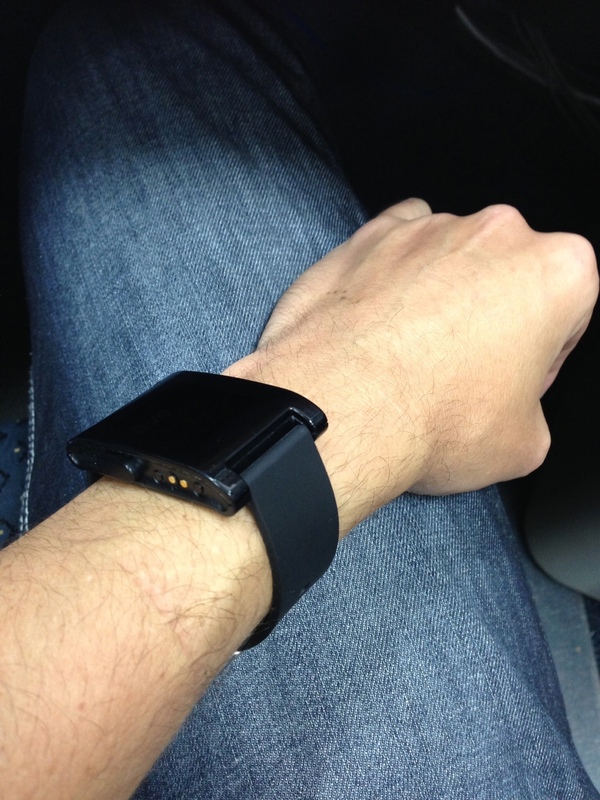 Inductive charging: I need to be able to take this watch off and put it next to me overnight. This would address the battery life issue, as I’d charge it daily. I could get around this by having a watch charger next to my bed, but I can’t imagine Apple wanting something so inelegant. Waterproof: Not worrying about getting the watch wet is huge. Also, showering with it on is great. No more cutting a shower short because I’m curious what’s buzzing on my phone (yes, another solution to this would be to be less uptight about missing messages). 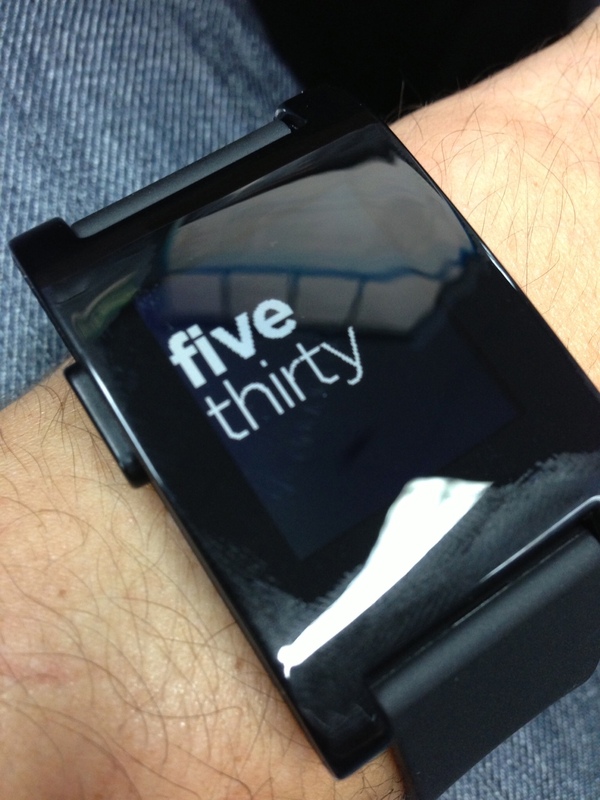 Flatter: The Pebble is gorgeous, but a little thinner would be even better. Customisable appearance: The perfect watch would be worn by everyone, and we can’t all look the same. Unlike iPhones, these things are permanently on display. 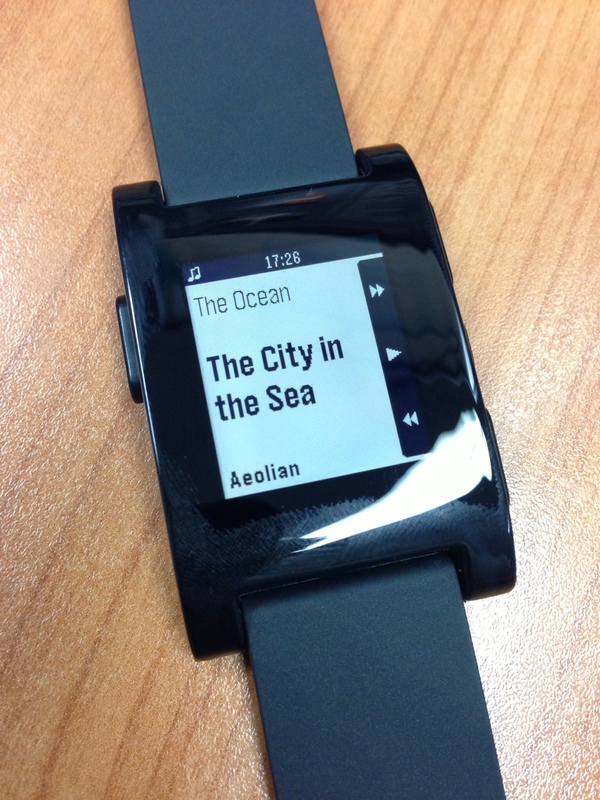 [Updated Jun 20] Colour display: Deep_Dvd in the comments pointed out that the Pebble uses an e-paper low energy LCD display, not an e-ink display, for a better refresh rate. It would be great to get a colour display on an Apple watch, but I don’t know enough about the technologies out there to be able to contribute much in the way of commentary. e-ink: The e-ink display is great, but it needs colour. However, colour e-ink displays are muted and not particularly appealing from what I’ve seen. So I guess add ‘improve e-ink technology to make it bright as LEDs’ is a corollary to this. To be honest, it might be asking a little too much. 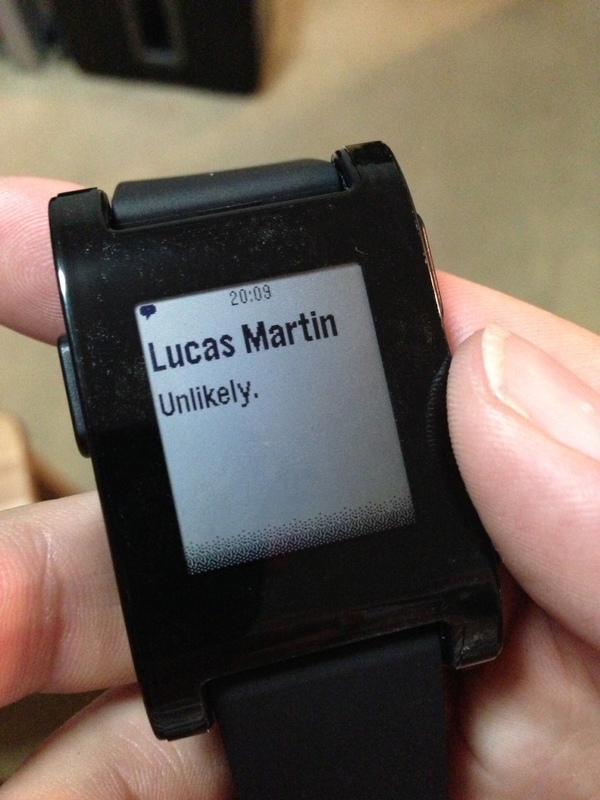 Even larger display: Ideally, the entire face of the watch would be an e-ink colour screen, allowing the entirety of it to be reskinned at will, instead of just the little post-it. In effect, I’m saying the bezel of the watch needs to disappear. A larger display also means more screen real estate for applications. Deep notification integration: Should be trivial for Apple. Touch enabled: not sure if this would even work in practice, and I haven’t missed it at all. But to be a perfect device we need some better interface options and no big buttons because buttons aren’t pretty. Microphone: if this thing had a microphone I could use the bluetooth controls to activate Siri. Siri would need to talk back to the UI somehow, but this seems pretty straightforward. Speaker: Maybe to provide sound notifications if desired? This entry was tagged reviews, Tech. Bookmark the permalink. Sounds good. Looks a bit big for my taste, but I guess these devices will come down in size. I’m still not sold on them as a concept (I want fewer gadgets, nor more!) but this review does make it sound like a pretty cool device. Nicely kickstarted! Nice review! I’m loving mine too. if you take really hot showers, might be worthwhile to take it off or at least keep it in mind and try to slowly ‘acclimatise’ it somehow as the water heats up. Yes, thank you! I learned that it wasn’t e-ink myself just recently, which explains why it just goes off when it’s off, lol. I will edit the review later today to reflect that. I hope you get your Pebble soon. I’m still very happy with mine. Do you receive reminder notifications as well as calendar notifications? You receive any notifications that appear on the iPhone ‘lock’ screen, as per your notification centre settings. 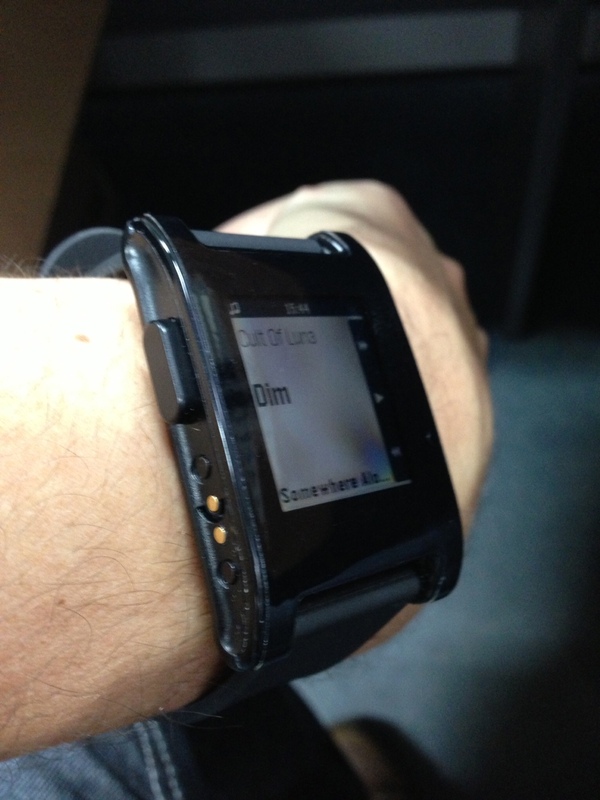 However (and this is the biggest current iOS problem with the Pebble) if the Pebble disconnects and reconnects, the disconnect resets which notifications are displayable back to the iOS defaults (SMS/iMessage only). This means you need to reopen notification centre, and toggled off->on the ‘Display in Lock Screen’ setting at the bottom. I have heard that with ios 7 that is going to get better. What do you think? Yes, absolutely – I read that there were specific iOS 7 improvements for these kinds of devices. Of course, I read that to mean they were preparing iOS 7 to work with their own rumoured iWatches, but I definitely think this will mean good news for Pebble owners.